Monokulare und Ferngläser mit Porro-II-Systemen weisen eine typische Bauweise des Prismengehäuses auf: dieser ist zylindrisch und wirkt wie eine runde Dose (s. 3. Foto). 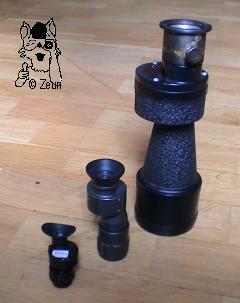 Monoculars and binoculars with a porro II system have a typical construction of the prism body. 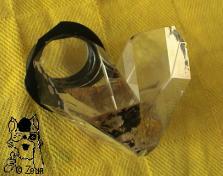 It is cylindrical and looks like a round box (s. 3. photo). Die Konstruktionszeichnungen zeigt den Strahlengang innerhalb eines Fernglases (hier historisches Modell) und im Prismensystem (s.u.). Das ältere "Ross 7x50" zeigt die Prismenkonstruktion aus dem Schema: 2 aneinander geklebte Prismen (die innere Okularlinse - Bildfeldlinse - ist festgekittet); im Mini-Porrosystem (letztes Bild) wurden 3 Prismen zum Typ 2-System kombiniert. The construction sketch shows the path of light within the biinocular (here a historical model) and through the prism system (s. below). 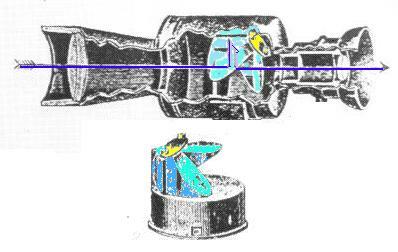 The older "Ross 7x50" has the prism design from the sketch: 2 prisms cemented together (the inner ocular lens cemented to the prism); themini porro system (last picture) has three prisms combined to a porro II system. 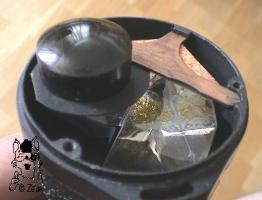 In der Prismendose werden die Prismen entweder durch einen angeschraubten Metallbügel oder direkt vom Deckel gehalten. 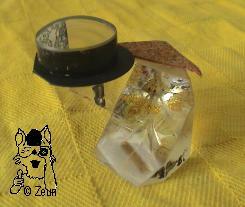 The prisms are held either by a clamp or directly by the prism body cover. 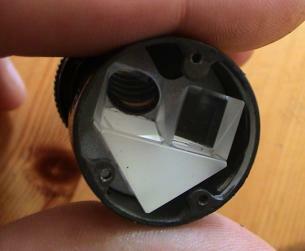 Ein weiteres Beispiel für ein Porro II-Monokular ist das Carl Zeiss 18x50, das Barr & Stroud CF41, das YM8-1 bzw. YM8-2. Another example of a porro II monocular is the Carl Zeiss 18x50, the Barr & Stroud CF41, the YM8-1, and the YM8-2. 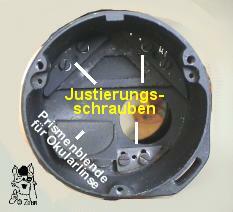 Fotos: Zeun; Schemazeichnung adaptiert aus F. Watson "Binoculars ...", S. 16f.